Earlier Bankera, an ambitious startup intended to cover the crypto “banking” sphere, has announced it’s almost ready to issue new prepaid Bitcoin ATM cards that work. This could not have been timed better, considering both Visa’s and MasterCard’s crackdown on crypto cards. Bankera claims the cards are already issued and shipping starts now. 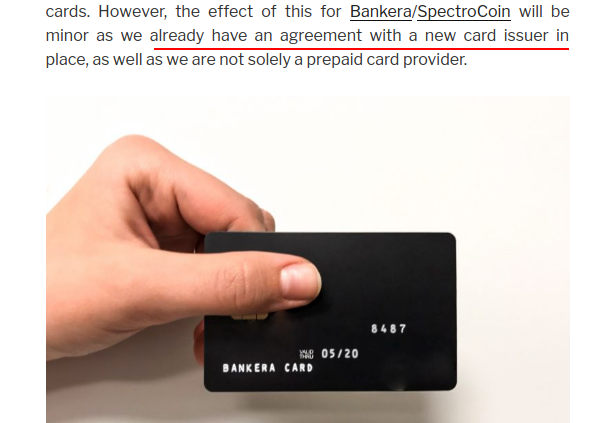 Bankera is partnered with Spectrocoin, so first of all it’ll service Spectrocoin’s card users that had their card disabled recently. We’ve mentioned Spectrocoin is looking for solutions in one of the previous posts – and we’re glad to see there are results of that search! Sign up to Spectrocoin now and get in line to receive your new working Bitcoin ATM card! Bankera itself is running an ICO and accompanies it with reassuring and impressive news, such as, reports of buying a bank. We’re not in the business of advising ICOs to invest in, so do your own diligence, but we’re really hopeful for at least a viable prepaid card solution from these guys. Which means that hopefully in the next months new customers will be able to use their prepaid Bitcoin cards. The cards will supposedly work nearly worldwide, not just in SEPA countries. To get in line without wasting any more time sign up here. Great to see some firms fighting for financial freedom! Yes there will be some crypto scams and hacks. But a separation between the states and economies will do even more long term good for freedom and humanity than the separation between church and state. Invest if you can!